In Part 1 of this analysis, I focused in on the vision of salesforce.com and how well they presented it and executed against it. But that doesn’t make them perfect, though they are arguably the market leaders in social business software/services. So, with the vision and their strategic thinking as the framework, let’s take a look at some of what they announced, the strengths and some of the shortcomings they still have to deal with in part 2, the final part of this rather verbose (as always) piece. They also announced hundreds of core improvements in all the products they currently have and a roadmap for the products that will be released in the future. Let’s look at a few on this list – those most interesting from a customer-facing standpoint. This is table stakes. I suspect (and denying it isn’t going to convince me otherwise) this is both because salesforce realized that they are a bit deficient in mobile and that touch is becoming mandatory for mobile devices – and (this is a big one) Microsoft Surface tablets are looming with the announcement of their pricing just this week). Microsoft’s pressure, Apple’s success, requires salesforce to provide touch in order to stay contemporary with the requirements of the workforce going forward. The good thing is that they’ve got it done already. This isn’t future think. This is a product that mimics the cloud storage services out there like Box.net and Dropbox, the two industry giants. They are major success stories in their own right and have each become a necessary part of many a person’s day – business and often, personal. I’m a very happy Dropbox user, which along with Evernote allows me to handle an incredible amount of the logistics of my work and some of my play. Chatterbox is salesforce’s proprietary version of those, so that theoretically, you don’t have to leave the salesforce system to access your files in the cloud. While I’m sure that this is a good idea for a product, I’m not wild about it for more than one reason. Box.Net is a salesforce partner – one that salesforce put some money into last year. Dropbox is of course the other major player in the cloud storage services industry and it has an integration with salesforce, though through third parties like Zapier. That is absolutely fair. But they still could do better. Chatterbox is representative of this thinking and of how they could do better. Rather than build a strong ecosystem that allows for key strategic partners who’s functions and technologies you don’t reproduce, you embrace instead and sink some dollars into making them stronger, which makes you stronger. This product wasn’t so strategic that they needed to do it. Though I imagine when it’s actually done, it will be a decent product. It actually goes to a larger issue with salesforce, which is a partner community that is pretty much a one-way street, though a substantial one with benefits for the partners. The AppExchange, which I still consider a brilliant idea after all these years, is a great opportunity for technology partners to take salesforce’s excellent open API, and build integrations with salesforce that can be certified and placed in a well seen marketplace for sale. There are over 1700 AppExchange apps in the marketplace, which is an impressive number. But this still falls short of a partner ecosystem and is nowhere near as substantial as Microsoft’s partner network for example. Microsoft represents the paradigm for partner programs with a view to building a fully integrated ecosystem that can, in effect, enable the technologies that you need to support your life end to end – at least ideally. The way that Microsoft looks at it is to define what they want to build, what they need to buy and what gaps they need to fill to complete their technology ecosystem via partnerships and they then support the partners fully as if they are part of the parent company. Two anecdotes highlight this. Story #1 – I know of an instance where Microsoft decided to build a piece of technology that had previously been filled by a partner. What they did rather than just compete, is work with the partner to reposition their product within the ecosystem (in a really smart way actually) so that it remained as part of Microsoft’s go to market offerings. That’s classy and concern for a partner. Story #2 – I recently had the honor of keynoting an independent Microsoft Partner conference (fee thingee and expenses kind of keynote) and had the opportunity to see 450 partners of varying stripes and sizes and speak with several dozen. What I realized, that aside from a number of whiners who think that Microsoft owed them everything (thinking like that flabbergasts me. Partnerships are opportunities to seize upon, not handouts), the partners level of cooperation with Microsoft was rather profound. It wasn’t a bazaar of products. It was a truly integrated ecosystem. Its no wonder that over 95% of Microsoft’s $32 billion in revenues are from partners. While the AppExchange in combination with some strategic partnerships (e.g. Infor) is certainly a credible channel/partner network and nothing to be ashamed of, especially salesforce revenues are direct sales, not partner derived, salesforce could be better here. I have a few ideas but there is no place for that here. Perhaps down the road. But a serious look at how Microsoft does it would be a good start – with adjustments of course. I was prepared to be totally skeptical about the forthcoming Chatter (external) Communities for Partners; Customers: Service Cloud and Sales Cloud, but after seeing what salesforce is offering, I’m pleasantly surprised. Consistently with their belief that Chatter is a layer in the platform, these communities are functionally baked into the value chains so that they seem to be organic. In other words, they are DNA-level products – key to salesforce’s vision. Where they differ from the pure Chatter product is that there are channels that allow bidirectional communication with customers and partners as well as employees. They are console driven so that the community that they serve e.g. service or sales has a front office and substantial administrative features that they will provide when released in early 2013. Each of them of course has specific challenges to consider. So for example, knowledge management creation, distribution and consumption capabilities are substantial requirements for the Service Cloud Chatter Communities where the integration of sales intelligence and sales optimization components need to be considered for the Sales Cloud Communities. But the promise of these communities are pleasantly more substantial than I expected them to be. My expectation was inverted versions of existing Chatter Communities but they are more than that. Not too long ago, Marc Benioff, in an earnings call, said that he saw the Marketing Cloud as their next billion dollar business. There is a compelling case for a very large revenue stream from marketing related products and services, no doubt about that. I can’t speak to the estimated dollars here, but metaphorically, Mr. Benioff is right. That said, there is something that I have been pounding the drum on for a long time and I think that salesforce may be slowly but surely getting it. In order to provide a salesforce.com Marketing Cloud in the way that they have provided CRM pillar services Sales Cloud and Service Cloud, they are going to have to provide traditional marketing functionality in conjunction with social marketing. While arguably more and more marketing departments are addressing the social world via external social networks like Twitter and Facebook (you go, Buddy Media! ), the more traditional marketing channels from advertising on TV to email marketing and the growth of content marketing all are not only still viable but still have measurable returns. If salesforce aspires to be part of the DNA of their customers, then they have to meet the need for addressing all the channels not just social channels. Their competitors/partners are have all these components and are more trusted in the marketing space than salesforce is and as witnessed by the Marketo acquisition of CrowdFactory earlier this year, are addressing social channels themselves. Because salesforce already has more traditional components built into their flagship Sales Cloud and Service Cloud, to NOT have the traditional components in Marketing Cloud would be a noticeable eyesore and problem. In effect, they are competing against themselves. That said, what they have done well is to marshal their assets which are the staves of Radian6 and Buddy Media to build the social components for the marketing cloud out. Luckily for salesforce, they have the excellent Marcel LeBrun (CEO of Radian6) and the exceptional Mike Lazerow (former CEO of Buddy Media) spearheading the effort. Smartly, Ryan Strynatka (Radian6 VP of Product Development) is driving the technology effort so it will get done. Analytics. Analytics. Analytics. This is something that salesforce needs to stop dicking around with. They don’t have anywhere near the quality of analytics that they need in a world that seems to be consumed with big data and actionable insight not just as buzzwords but as business concerns. This one puzzles me no end. Even with the brilliance of the Radian6 Insights Platform, which can potentially handle analytics as a set of business services, after 18 months, they only have eight partners most of which are some form of social analytics or sentiment analysis, but they don’t provide anywhere near the power of what Business Objects gave SAP and what companies like Oracle, and IBM for example have in abundance. I don’t know, maybe they should just buy SAS. Kidding? Probably, yeah, in SAS’s case, but Salesforce can’t partner on this one. They need to either build or buy. Buy. Salesforce spent much of Dreamforce announcing new products that either filled functional holes in their ecosystem (Work.com) or were designed to weave through the product matrix (Chatter Communities). To reiterate something I said earlier, this was a good thing, because the lack of dramatic announcements highlighted the hard work that was going to fill out the platform that all your business applications would run on – as a social business. Salesforce was aligning its products with its vision. But what I remained unconvinced about is how this played out as Josh kind of puts it. A little bit of thissa, a little bit of thatta, with an emphasis on the latta (as a song from Damn Yankees goes). A string of product announcements that didn’t have the overarching narrative that was required to place the technology ecosystem squarely in the wheelhouse of the vision wasn’t there, making me queasy about salesforce’s ability to provide a customer with the complete ecosystem that their vision actually specifies. One thing I heard in casual conversations with some of the analysts was a concern for the ability of the current generation of salesforce’s architecture to support the vision of this seamless technological ecosystem and platform. I can’t speak to that so I won’t. To me, the problem at this juncture I can address is an incomplete narrative and as my friend and business strategist Alan Berkson says, “#1 is the story.” Salesforce is very convincing when it comes to the big picture vision, I think we can all agree on that, n’est ce pas? They are also convincing in their ability to show each of the technologies in a siloed way – e.g. the strength of Sales Cloud or the strength of work.com as a product or data.com the same way. Each of them seems to be solidly constructed, feature rich, flexible and has use cases to support it and a roadmap to its individual future. They are also good at showing the technologies categorically – e.g. desk.com and do.com addressing small business needs. NOT SMB – “M” needs (midsized businesses) are very different than “S” needs. I wish that SMB would go away as a term. What we saw at Dreamforce 2012 repeatedly was the announcement of a product, the discussion of the product and its roadmap, the use of the product by a customer and how it specifically was used in each company and then a senior executive of the customer coming up on the stage and being interviewed by Marc on the concept of social business and how they thought of it at (fill in customer name). What was fascinating to me was the use of what I will forever be calling a virtuous oblong (those of you who have heard the expression – virtuous circle will think I’m stupid but you’ll get it when you see the diagrams here). These were designed to show how salesforce products were used as social business enablers in specific ways at specific companies. They are really nice visual expressions of use cases that highlight how different social businesses can be at their process driven and outcome focused cores. 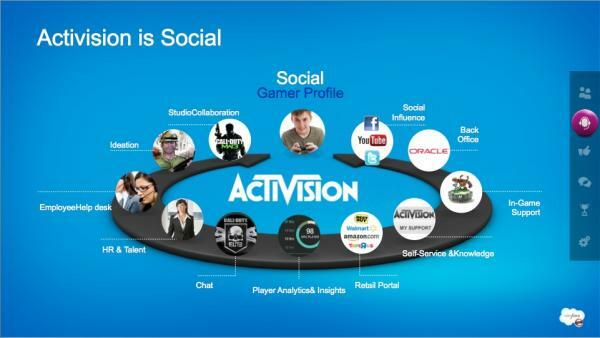 For example, here are two – GE and Activision. Just look at them and the differences. You’ll understand what I mean. Salesforce uses this virtuous oblong to show how each customer connects to the salesforce vision of social business via the Sell, Service, Market, Collaborate, Work, and Innovate categories. No problem with the customer representations. 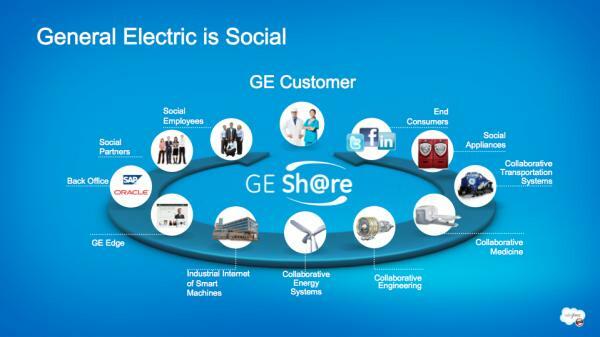 But something is amiss when it comes to their general representation of their social business ecosystem. All of the above mentioned areas exist on an exactly equal plane – with a circle apiece. Wrong. I would venture to say, for example, that collaboration and innovation are not anywhere near the same actions as sell, service, market. “WTF, who cares?” you might be thinking. Are you nitpicking? No. Let me give you a practical example of this line of thinking. When Chatter 1.0 came out, I wasn’t particularly thrilled by it. It was filter-free, which meant you didn’t have the ability to determine what you wanted to see. If you subscribed to a stream, you saw all of it, relevant to you or not, you had the whole stream delivered. More importantly, they were seeing Chatter as an application. I wrote at the time that it worked as a layer in the platform and not as a standalone application. I was right. Luckily salesforce.com thought that was the way to go too and now Chatter is treated like matrixed superglue for their entire ecosystem. As a layer. In order for salesforce’s vision to be applied as a practical matter, salesforce needs to view collaboration and innovation differently than sales, marketing and customer service. Collaboration and innovation are far broader concepts that are hallmarks of social business thinking; sell, service, market are business activities. Collaboration and innovation are fundamental tenets of social (human) behavior that will help selling, service and marketing be successful but have far bigger implications for the success of social business. The risk to salesforce if they don’t address this misplaced picture of their ecosystem (a la Josh Greenbaum’s comment) is that someone else is going have a compelling story that does. There are implications in treating collaboration and innovation at the level of a function, which are the same as those which would lead to thinking of Chatter as an application, not a DNA level platform layer. All three of their primary competitors are on the train to try to craft a more compelling story at the moment. With multiple other flaws, Oracle is attempting to enter the social relationship space (their term for it) and they are working hard on aligning products well beyond CRM around a customer experience suite. Though, I think that, of the Big 4, Oracle is the one that is beginning to diverge from the pack to something that, as Larry Ellison put it (paraphrased) “makes Amazon our competitor, not IBM.” (More on that in my upcoming coverage on Oracle Open World 2012) Even more threatening at the moment is Microsoft’s reinvention and redesign of their entire line of products with a strong focus on user experience and user interfaces that is getting kudos from analysts, media and customers. The most direct threat, ironically may come from SAP, if they don’t shoot themselves in the their own foot. SAP GVP Sameer Patel created a compelling social ecosystem that is threaded throughout by a entirely redesigned cloud-based collaboration focused product and services line. At the moment, much like salesforce, this is present as future but it has the story straight and the products fully aligned. For any company dependent on a visionary approach, this is a must-have and must fix. There is no question of one thing. The salesforce.com trajectory is stratospheric. They are the only company in the information technology industry who’s vision is so compelling at the business level that thousand of businesses are able to think “I can see myself doing that.” Salesforce has managed to establish themselves as the most likely technology company to be part of the DNA of businesses who are entwined in the 21st century revolution in communications. They are doing what they committed to do a decade or more ago, which is to be the platform, the network, upon which all businesses run their applications – and even more. They are, as Jeff Bezos said, “stubborn on the vision, flexible on the details.” They are arguably the business world’s masters of the universe when it comes to the dedication to this concept. Salesforce is also doing what it has to do to get industry and the popular buy-in. On the former, they are filling out their social business ecosystem with the pieces that they need to fill it with by building, acquiring, and partnering. They don’t need dramatic new announcements. Chatter is becoming their layer of Superglue to bind these together in many ways. It may be their most important component – for that purpose. On the latter, selling to the public, CEO Marc Benioff is doing his job, which is global mindshare capture and making sure that his company delivers on the vision and that the implications of that vision are acted on. That “pre-sold” vision, for salesforce is a requirement of business, unlike any other company I’ve seen in recent years. Buy-in isn’t just utilitarian in their case. One needs to buy-in to the company, not just the functional value of the products. They have mastered the emotional part of business – the one that makes a customer feel that involvement with salesforce is involvement with something game-changing Whether it is or it isn’t. My mantra has always been “you don’t have to have luxury, you just have to feel luxurious.” For all intents and purposes, they’ve succeeded at that. That said, they still have some work to do. They need to rethink how they are shaping the components of the vision (innovation, collaboration, sell, service, market). Their technology ecosystem will suffer a bit until they do. If they truly intend to make marketing a $1 billion business, they need to fill out the components of the marketing cloud beyond just the social components. They need to concentrate on their biggest application side hole analytics and once they do, assign it a place in the narrative. They should reconsider how they are thinking about partnerships and the channel. Less just a bazaar and more an ecosystem. Marketplaces are great because the barriers to entry are low, the IP is available (via the API) and the cost of entry isn’t high. But it isn’t a deliberate filling of the gaps. Plus, there is room for a marketplace within an ecosystem. All this said, there is no question in my mind that salesforce is not only the company to beat, but also the company to dream with – at least for now.